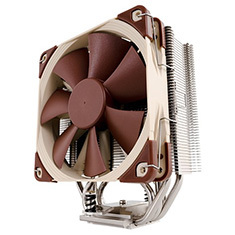 The NH-U12S is the latest 12cm model of Noctua's classic U-series single tower CPU coolers, which have received more than 400 awards and recommendations from the international press. The S-version's 45mm slim shape guarantees 100 percent compatibility with tall RAM modules and at the same time, its fine-tuned design and the class-leading NF-F12 FocusedFlow fan with PWM support for fully automatic speed control allow it to further improve its predecessor's renowned quiet cooling performance. Topped off with the trusted, pro-grade SecuFirm2 multi-socket mounting system, Noctua's proven NT-H1 thermal compound and full 6 years manufacturer's warranty, the NH-U12S is a complete premium quality solution that combines outstanding performance, quiet operation and excellent compatibility. Compatible with Intel 1150, 1151, 1155, 1156, 2011 and 2011-3 as well as AMD Sockets FM1, AM3, AM3+, AM2 and AM2+.